Pennsylvania Whiskey: Michter's is sold to new owners. Michter's is sold to new owners. "A Lebanon County landmark has been sold, and the new owners say their goal is to make it safe. Michter's Distillery, also known as Bomberger's Distillery, has been in a state of disrepair for decades and has become both an eyesore and a public-safety hazard. "Our number-one priority is to clean it up and get it safe," new owner John Barry of JJC Investments said Tuesday. Barry and his family own the adjoining Lebanon Farms Disposal property in Heidelberg Township. They bought the Michter's property from Dwight L. Hostetter of Cleona for $250,000 at a settlement on Friday. Hostetter had owned the property since he bought it in April 1999 for $185,000, according to the Lebanon County Assessment Office. A total of $23,892 in taxes dating back to 2009 is owed on the property, not counting Elco School District property tax, which has yet to be set for this year. The property was listed for a tax sale in September. Many of the roughly 10 buildings on the 21-acre site are falling down, Barry said. Those that can be salvaged will be used for warehousing. "We will utilize the silos for grain storage," he said. After a warehouse at the corner of Distillery and Michter roads collapsed on Sept. 22, the Heidelberg Township supervisors sought and subsequently obtained a court order from county Judge Samuel Kline to force Hostetter either to clean up or sell the property. on the grounds of the distillery, which ceased business operations in 1989. The property has been listed on the National Register of Historic Places since June 1975 and was declared a National Historic Landmark in 1980. It closed when Michter's filed for bankruptcy. 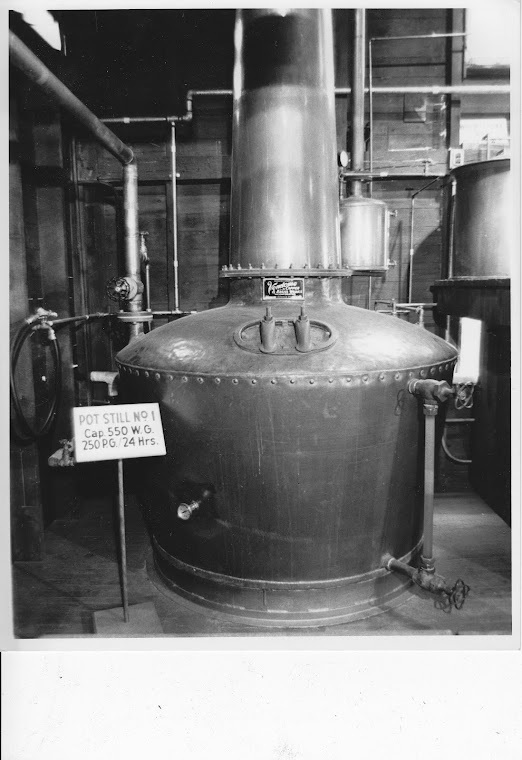 Whiskey production at the site began in 1753. It was purchased by the Abe Bomberger family in 1861, was sold shortly after Prohibition went into effect in the 1920s and was reopened by Ephraim Sechrist in 1934. Three large, cement-block warehouses were built between 1933 and 1950. Karen Arnold of the Pennsylvania Historic and Museum Commission said a 20 percent tax credit is available for properties used as income-producing but added, "demolition costs would never be allowed." Lancaster County has been a heavy user of those tax credits, but only four properties in Lebanon County have benefited, all in the 1980s: two former railroad stations in Lebanon, the Landis Shoe Co. building at Chestnut and Broad streets in Palmyra, and Rescue Fire Hall in Annville. Arnold said Michter's "remoteness" is a problem. Although it is not far from Route 501, there is no direct line of sight from that state highway to 215 Michter's Road. She last saw the property about 20 years ago. "It wasn't good then," she recalled. 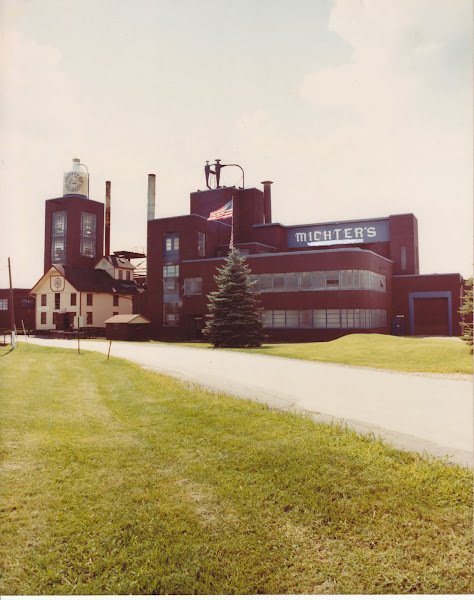 Michter's, identified as Bomberger's Distillery, was listed on Preservation Pennsylvania's At Risk list in 1994. Only 2,500 properties are listed as National Historic Landmarks, Lebanon County Commissioner Jo Ellen Litz noted. "I agree that there are severe deterioration issues there, and some of the (circa) 1940s cement block buildings may be able to be removed," Litz wrote in an email. "If a prospective developer needs federal funds, licenses or permits for a project that involves an adverse effect (demolition) to the buildings, there are federal regulations that need to be complied with." Again, this is not my writing, but Steve Snyder of Lebanon Daily News. A big thank you to him for writing this article! So what's next? Who knows. Guess I have some phone calls to make! what happened to tocollecters bottles ? how do i find out what they are worth? i have a lot why can not i find any thing out? I have several articles on here on that matter- Everything from a complete list of bottles to why you won't find any information on values. The market is just too up and down to assign most decanters and bottles a value. There are some that are rare and certainly bring a good price, but others you just can't seem to give away. Contact me about specific decanter values and I can give you a good idea of their current worth, but not an exact number.